Reef Palms Motel Apartments is a great value motel that is centrally located in Cairns and offers a relaxed, tropical environment for its guests. The self-contained accommodation suits a variety of travellers. Whether you’re a guest visiting on business, a couple, or a family on holiday in Tropical North Queensland, our comfortable accommodation will ensure your stay is memorable. Reef Palms Motel Apartments in Cairns is close to all the amenities you could ever need. Restaurants, cafes and shops are only a short walk away. 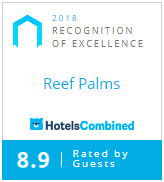 Whether you are in Cairns for business or pleasure, Reef Palms is a great value motel that offers a relaxed and comfortable stay for all its guests. FREE WiFi Access is available for all our In House guests. Located 4km from the Airport and only 2km from the city centre, our-self contained apartments are amongst the best apartment accommodation in Cairns. We offer free Airport drop off for departing guests only, and a free shuttle bus service that goes to the Cairns shopping precinct. For the holiday maker our tour desk is able to arrange all tour bookings, car hire and even onward travel arrangements. All our Cairns apartments feature air conditioning, ceiling fans, queen size beds, private balconies, kitchen facilities, television, room safes, direct dial telephones and so much more. Fully self contained, in a great location in Cairns, easy access to everything Cairns and its surrounds offers are just some of the features of this affordable Cairns accommodation for any traveler. Our family had a wonderful stay, great location, modern, very clean with everything you need. Our family loved the pool! Thank you we will be back. Great place to stay with a teenager, close to everything. We found the staff and hosts very friendly and helpful with tours, restaurants.